Last-start Missile Stakes winner Pierata (r) is favourite to add the G2 Tramway to his record. That doesn’t make his task much easier with Saturday’s Group Two Tramway (1400m) boasting six Group One winners in the 13-horse field. But trainer Greg Hickman believes Pierata is up to the challenge after his last-start win over Kementari in the Missile Stakes in which Showtime ran fifth with both those horses to run in the Memsie. “He has done well and I think he has come on from the Missile,” Hickman said. “I can’t say anything negative about him but he will have to be on his game. “It is a strong race with Group One winners in it and obviously a horse like Le Romain will be hard to beat. The Kris Lees-trained triple Group One winner Le Romain is topweight with 59kg, two kilos more than Pierata who is the early favourite. Pierata was at $3.30 on Thursday with Le Romain at $3.70. Lanciato, fourth in the Missile, was at $7 with Tom Melbourne at $8 and the only other runner under double figures. 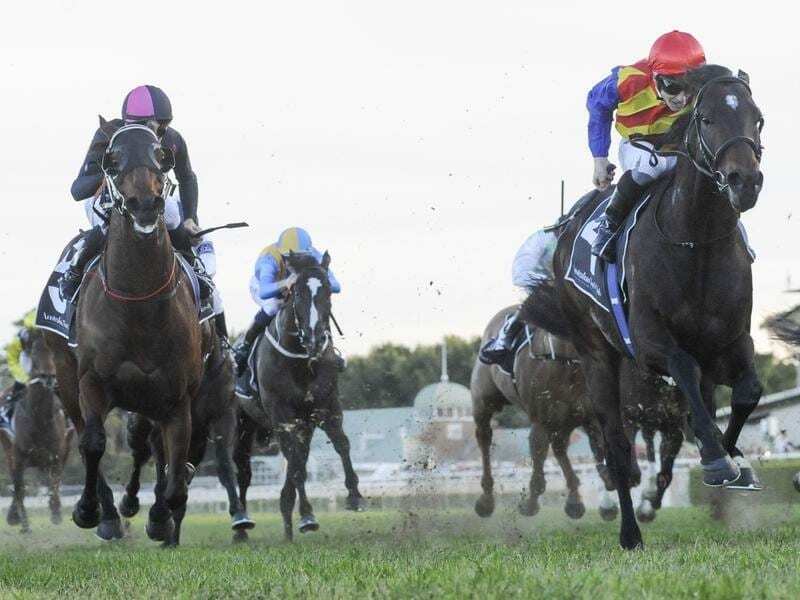 Since his Missile success on August 4, Pierata has been kept up to the mark with a barrier trial win at Rosehill last Monday week. After the Missile, there was a flurry of interest in Pierata as a candidate for a slot in the $13 million Everest in October. A slot did not eventuate and Hickman is more than happy to stick to his original plan to get a Group One win with Pierata to secure the horse’s future at stud. “After the Tramway he will go to Melbourne for the Sir Rupert Clarke Stakes,” he said. The winner of five of his 11 starts including the $2 million Magic Millions Guineas, Pierata has been to 1600 metres once when second to Kementari in the Randwick Guineas earlier this year.